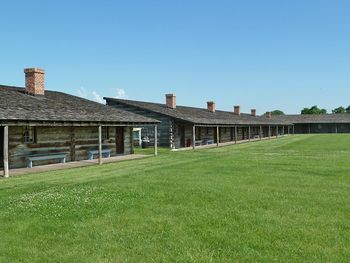 Fort Atkinson (1) (1819-1827) - First established in 1819 as Cantonment Missouri by Colonel Henry Atkinson and five companies of the 6th U.S. Infantry and the crack Rifle Regiment. Moved to Council Bluff in 1820 and renamed Fort Atkinson 5 Jan 1821 after Colonel Henry Atkinson, the first commander. Abandoned in 1827. Also known as Camp Missouri and Cantonment Council Bluffs. Established by the Yellowstone Expedition of 1819 led by Col. Henry Atkinson as the first of a string of proposed forts. The first post was built on the river bottom land and proved to be unsuitable in several respects. 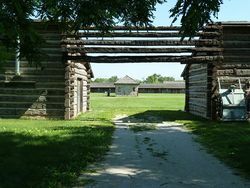 In 1820 the post was moved to the present location on Council Bluff and was known as Cantonment Missouri while under construction. The completed post was renamed Fort Atkinson for Col. Atkinson in 1821. The fort was a large stockaded post 455 feet by 468 feet that garrisoned up to a thousand troops. The outer wall was the back wall of the interior buildings which lined all four sides. The interior buildings were each about 20 feet wide with plank floors, brick fireplaces and shared interior walls. Log bastions were placed at the northeast and southwest corners and three large gates were centered on the west south and north walls. During the short life of the post, it served as the jumping off point for several expeditions and numerous individuals that participated in the opening of the west. As the westernmost post on the upper Missouri, it helped to support the development of the fur trade and set the stage for the coming western migration. The fort was abandoned in 1827 after Congress refused to appropriate the $3000 needed to refurbish and repair the post. Nowpart of the Fort Atkinson State Historical Park. Major portions of the fort have been reconstructed including three of the four stockade walls and the powder magazine. Several of the outbuildings have also been reconstructed. 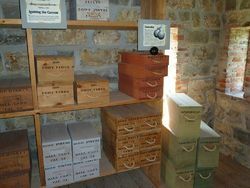 Several of the rooms along the west stockade wall have been reconstructed to portray their 1800's rolls and the powder magazine interior is also fitted out with representative contents. 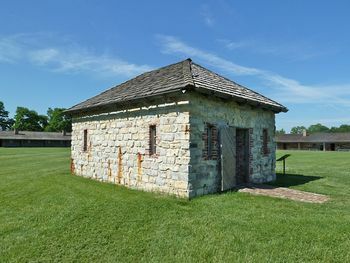 Location: Fort Atkinson State Historical Park, Washington County, Nebraska. This page was last modified 08:19, 16 March 2019 by Bill Thayer. Based on work by John Stanton.